This is a summary for McKenna at 4.75 years old. Eating continues on as normal. Sleeping is good. She hasn’t napped in a long time, even when I think she will because she seems tired. I don’t think she napped one time in the last month. This is good with nothing special to report. Her favorite things to do in her play time are to dress up, play with Barbies or baby dolls, and draw. She is getting more and more obsessed with drawing. Things are still great here! She is still being so good and kind and loving it. We have a plan for swimming lessons. We are thinking we will try group swim lessons and see if being in a group setting will motivate her to try–the idea of seeing peers do something you fear making you realize it might not be so scary. I think this will happen in March. Oh poor McKenn and her injuries. We were at a friends house and she tripped going down a flight of stairs that turns and she went head-first into a flat wall and busted her head open to the skull. I didn’t see it happen, but she walked into the room crying and blood was literally gushing out with her heart beat. I completely froze. I had no idea what to do and stood frozen in time. Sure, sitting here with no blood gysering out of my child’s head I can tell you the basic steps of what to do. I am not squeamish with blood–it was just so shocking to see my poor child like that! I obviously need to sit and talk myself through what I will do in crisis situations. It reminds me of the first time I threw up in my hand when I was pregnant with Brayden. Despite living in fewer than 300 square feet, I couldn’t always make it to the bathroom in time. So I threw up in my hand. Then I said, “Ew!” and flung my hand. Then I got to clean splattered throw up. It is so important to talk yourself through situations. Fortunately, there was a firefighter and an EMT there. They both sprung into action and stopped her bleeding and got it nicely bandaged for our ride to the hospital. And let it be noted that they moved methodically and not like a chicken with its head cut off. They stayed calm and deliberate through it all. This needs to be noted my my own future plans on how to react in situations. 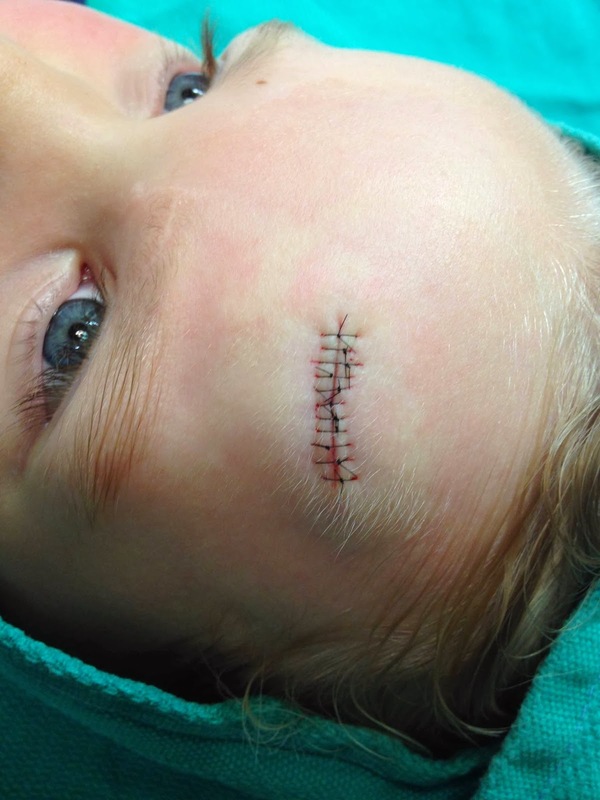 McKenna did NOT want to go get stitches, which is perfectly reasonable. It was close to bedtime so we called my dad and he came to our house and put our kids to bed while my husband and I drove McKenna to the hospital. I drove and my husband sat by McKenna and in the 15 minute drive, he talked a 4 year old into getting stitches. The man has skills with hyped up emotional people. How does he do it? I am not even sure even in my observations. I have told him he needs to write a post for you all because it is skill that we could all benefit from as parents. We went into the ER and fortunately for us our ER is usually pretty slow so far as ERs go so we walked right in and got things going. The doctor came in and looked at it. She told him she would prefer him to glue it and he told her it would need to be stitched. You could see this look of terror pass over her face, but she took a deep breath, swallowed, and said okay as she looked at him with huge eyes. They put some topical numbing agent on a cotton pad and put it on the wound and then let her choose a movie to watch while it numbed the area. The doctor also told her if she was perfectly still while he stitched her, she would get a popsicle when it was over, which is huge motivation for her! As I watched this situation unfold before me, I was again reminded of just how beneficial some of the traits that can make McKenna harder to parent in the day to day are. These are traits that are going to carry her through life with joy. These are traits that are going to bring that same joy to those around her. She is an amazing person. She is strong mentally. She will always look at the bright side, even when you are sure there can’t be one. I think I am pretty optimistic, but I pale in comparison. She doesn’t just look at the bright side, she embraces it. I wish I could adequately express the feelings and thoughts that flooded me as I sat in that ER room. It surpasses words. I had the distinct impression this experience was a necessary one for her and us to know and appreciate her strength. 8 AM Wake up, get dressed, eat breakfast. Possibly daily chore. 1 PM Chore if not done before school. Then typically Independent playtime. Hi Val, my son is the same age as McKenna. He is now in full-day JK, 8:15-2:45pm. When he is home after school I give him some snack then take a shower and head for a nap. Nap usually takes two hours because it's a long day for him to school. But he can't sleep until 9:30-10pm. He wakes up at 7:30am in school days. Teachers say he has lots of behavior problems. I'm not sure is it because he does not have enough sleep at night or not. I have tried lots of methods to teach him with consequences. But problems at school still go on with him. Should I start to skip nap for him so that he can sleep early at night like McKenna? Or shorten nap time to 1.5 or one hour? Please help, I'm very frustrated on his misbehave in school. He has one little brother, will be 3 in this month. aww, poor little girl. But i know exactly what you mean as mine tripped and fell against the coffee table and there was blood squirting everywhere and it was a huge gash (9 stitches)! I think as a parent you can get shocked as it's your child and you don't want anything serious to happen to them! BUT I cannot believe how she rose to the occassion! She cried 1 min max and that was it. And she is normally my crier and emotional one. I think she completely went into shock and she was still and quiet as can be and just was pressing a huge cloth on her chin the 15-20 minute drive in. SHe was perfectly still and the urgent care dr was amazed and had never ever seen a child like her! i always knew she was special, but like you the whole experience made my eyes more open to it. BUT having said all that, I never want to go through that again! It shortened my life a bit! And I'm not sure if i'd be better prepared. i am a calm person but i kind of froze up and was screaming for DH to come. it was traumatic! oh and if you figure out what you'd do different next time, please share! :) although i totally hope it won't be needed! Yes, please have your husband write a post on that! I would totally benefit from it. My son can be very dramatic, and I struggle with handling it sometimes. Fanny Foon,Yes I would definitely shorten the nap so he can go to bed earlier at night. He will need to go to bed early for years and years to come, so I would make that the new norm. Yvonne, it is amazing how they rise to the occasion! I think no matter what the situation is, we parents are often pleasantly surprised by how our kids do better than we think they will.And I think I will think through the best response and then write a post on it. It would be a good thing for all parents to have a game plan for! Okay Stephanie I will do it!